The Panache Cleo Lucille balconette bikini top has nautical print and three section cups. The bikini top is underwired, with lined, unpadded cups, adjustable shoulder straps and a snap clasp fastening. Panache Cleo Lucille Tankini Top - Nautical Print The Panache Cleo Swimwear Lucille plunge tankini top is underwired, with padded cups and printed design. Panache Cleo Lucille Tie Side Bikini Brief - Nautical The Panache Cleo Lucille tie side bikini brief has stripe print. 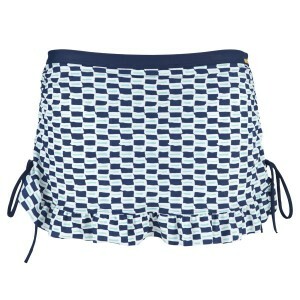 Panache Cleo Lucille Skirted Bikini Bottoms The Panache Cleo Lucille skirted bikini pant has a nautical printed design. Panache Cleo Lucille Balconnet Bikini Top - Nautical Stripe The Panache Cleo Lucille balconnet bikini top has moulded cups and stripe print. Panache Cleo Lucille Frill Bikini Bottoms The Panache Cleo Lucille bikini pant has frill detail. Panache Cleo Lucille Bandeau Top - Nautical Stripe The Panache Cleo Swimwear Lucille bandeau bikini top in nautical stripe has padded cups. The Panache Cleo Lulu balconnet bikini top has a floral print design and a snap clasp fastening at the back.